Mother Nature may have gotten the weather wrong, but she sure knows all about babies! 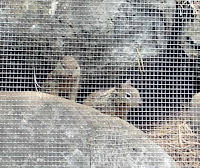 My rock wall just came alive with the baby ground squirrels. Two came out yesterday. Today there were three…then four…five…and finally six! 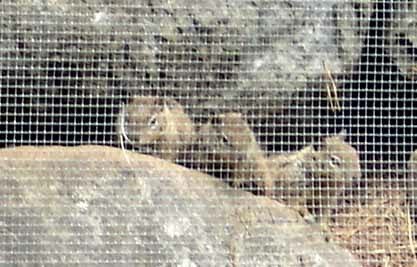 These pictures were taken from inside my home and through the screening of the cat enclosure. 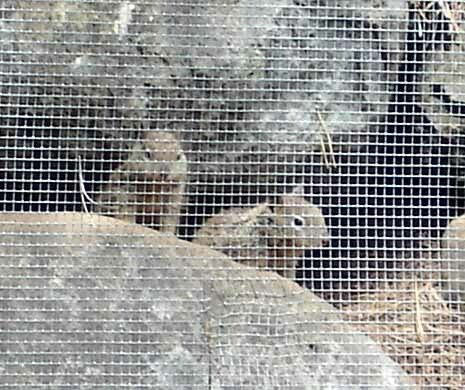 It’s hard to see that the babies are really small – about the same size as the chipmunks who also run on the rocks. The babies love to play, batting and tackling each other like football players. It’s very entertaining. I feel like I’m watching the squirrel channel – all squirrel, all the time! The two parent squirrels have been busy bringing mouthfuls of leaves into the many tunnels they’ve dug in the wall. One baby took a cue from its parent – I saw it dragging a 2 ft. stick into the tunnel! I can always count on a lot of Oregon rain when spring arrives, but there are many other special little moments that make springtime oh so magical! You might think they exist to remind us to stop and have fun! Of course, they have their own agenda. I never knew of ground squirrels. You’re so right – they are wonderful role models for HAVING FUN! Oh so cute!! 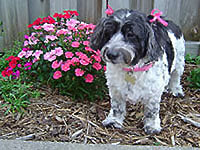 We have been enjoying our first spring in Oregon – the weather is rainy, but we love that. We’re really enjoying the birds that we hear and see from our balcony! Tammy, it really HAS been rainy – glad you’re enjoying it! I hope you get the ground squirrels on the coast. They love to live in rocks, so my huge rock wall is a favorite hangout.